These roots have grown over time, dropping of the side of a cliff. 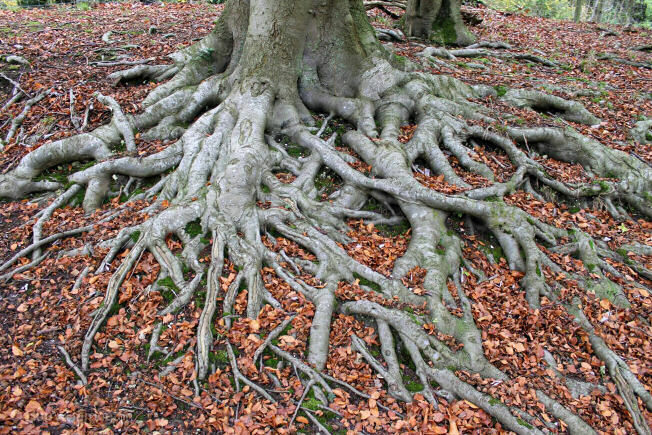 No, we are not talking about the Nebari fictional alien race from the planet Farscape, but the Japanese term generally used to indicate the roots and specifically the root flare at the bottom of the trunk where the root region starts. It also indicates the visible surface roots. My idea is to write three or so Blogs focusing on Nebari and the development of roots. There is no doubt in any Bonsai artist’s mind that the roots of a plant is where it all starts. Healthy roots = healthy plant (generally). A plant absorbs most of its water and nutrients from the soil through the roots. We therefore have to know something about soil and its water retention and draining properties. Not all soils are created equally. We also need to know something about the physiology and anatomy of roots. 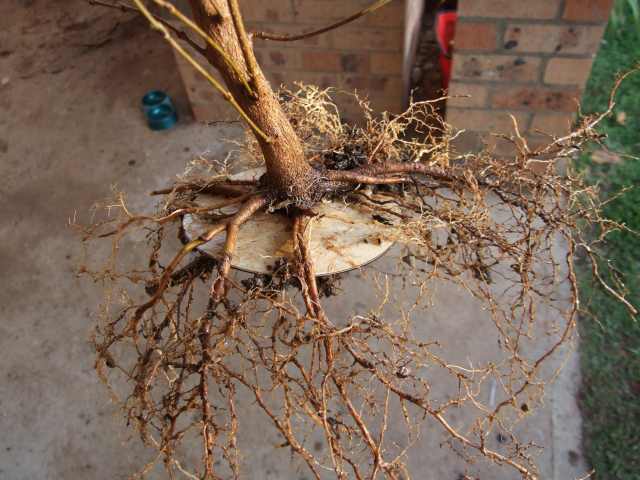 This knowledge will help us to understand many of the concepts around root pruning. This will come in later Blogs. A tree growing in a woodland area. These roots definitely add to the character of the tree and indicate that it has been there for a while. Getting back to the Nebari, the main aim of establishing a root flair at the base of a tree is to indicate age. A wider base caused by a flaring just above the roots, helps to establish the taper of a tree. One way to develop taper is to increase the circumference of the tree at the base and to keep the top of the tree relatively thin. Young trees do not have a huge flair at the base, but older trees show this without fail. In saying that, there are trees that are used for Bonsai that do not show a big root flare. Junipers come to mind here. The roots are spread over a flat surface and tied to this surface. There are multiple methods to improve the Nebari of a Bonsai tree. The first one is the continuous root pruning of downwards growing roots. For the health of the tree it is advised that this is done over time to enable the tree to grow new roots in the place of the removed roots. A second method is done through air layering. This is simply done through preparing the bottom of the trunk as one would for air layering and heaping up the soil or packing sphagnum moss around this area. Roots will over time establish themselves in that area. I have read about a method where a wire is bound tightly around the trunk just above the roots. The flow of nutrients will be impeded and that will cause new roots to grow from above the wire. I have not tried this method myself before and cannot comment on how successful it is. Other methods include drilling holes through flat tiles and tying the roots of the tree in a horizontal direction to the tile with wire through the drilled holes. It could also be done through grafting. In the end, the Nebari plays a vital role in the aesthetics of the tree. It is crucial th at some sort of Nebari be established as it indicates age, shows that the tree is balanced and sturdy and has been there for a long time. The next Blog will address the science behind root development.